Your driver will meet you at Casablanca’s Mohammed V airport. Depending on the time of your arrival, you may go directly to your hotel to check in or you may start the tour of Casablanca immediately. During the city tour, you’ll see the bustling city center with its Art Deco architecture and lovely seaside neighborhoods. You’ll also tour the magnificent Hassan II mosque, which is the second largest mosque in the world and one of the few open to non-Muslims. You’ll return to your hotel in time for a leisurely dinner. Depart for Rabat, Morocco’s capital city, and once there, see the outside of the royal palace and tour the mausoleum of the late King Mohammed V, which is always guarded by royal cavalry. You will also see the Hassan Tower and the Oudaya Kasbah, which sits high above the Bou Regreg river opposite Sale, the historic home of the Barbary pirates. From Rabat, you’ll continue to Meknes, where you’ll have lunch in this former imperial capital city, built by Moulay Ismail in the 17th century. You’ll see the ruins of the royal stables, which once housed 12,000 horses, and experience the austere beauty of the mausoleum of Moulay Ismail. Other sights in Meknes include the ancient House of Water reservoir and the magnificent city gate, Bab El Mansour. Continue to Volubulis, the ruins of the largest Roman settlement in Morocco. Arrive in Fes for dinner in your hotel or riad. You will spend the entire day on a guided tour of Fes, which was founded 1,000 years ago by Moulay Idriss. During your walking tour of the labyrinthine old city (this is a day for comfortable shoes), you will see the outside of the 13th century Karaouine mosque, tour the Bou Inaniya madrassa, and visit the souq to learn about Moroccan crafts. After lunch in the medina, you’ll see the newer city, including the potter’s district, which is home to Fes’ famous blue pottery. You may have dinner at your hotel or in the medina. The drive from Fes to Merzouga will take you through the Middle Atlas mountains. You’ll pass through Ifrane, home to both a ski resort and the prestigious private university, Al-Akhawayn. After Ifrane, you’ll wind your way through Morocco’s famous cedar forests (keep an eye out for the local monkeys!) before having lunch in the town of Midelt. Some distance past Midelt, you will begin to descend toward Er-Rachidia, crossing the Ziz gorge. You have the choice of spending the night in a hotel in Erfoud, or you may continue directly to the dunes in Merzouga to spend the night in a nomad tent. In either case, you’ll see the sun rise over the dunes the next morning. After breakfast, visit a museum and store featuring 300 million year-old fossils. 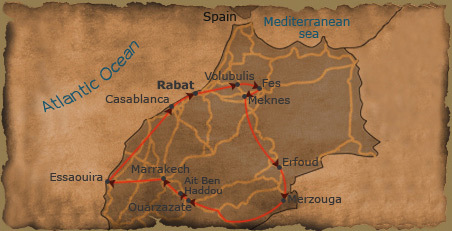 You will travel toward Ouarzazate via the Valley of 1,000 Kasbahs. You’ll make your way into the amazing Todra Gorge near Tinghrir (lunch optional). From there, you will continue past several Kasbahs toward El Kalaa Mgouna, which is known for vast fields of pink roses that are used in perfume. Many small shops selling rose products, such as rose water and rose-scented soap, line the road. Continue to Ouarzazate, the Hollywood of Morocco, for dinner at your hotel. After breakfast, you will tour Ouarzazate and visit the 17th centrury kasbah, Taourirt, which was one of Basha Glaoui’s homes. On your way to Marrakech, you will pass by Morocco’s largest film production center (visit optional) and take a short detour to visit Ait Ben Haddou, a spectacular kasbah that has been featured in many films. From there, you will cross the High Atlas Mountains at the Tizi N’Tiscka pass; at 7,400 feet, it is the highest pass in Morocco. Spectacular views of the valleys are revealed as you wind your way down to Marrakech for dinner at your hotel or riad. Enjoy a full day exploring Marrakech with a local guide. You’ll see the historic Koutoubia Mosque, known for its four distinct faces, and the Saadian tombs and Bahia palace, which showcase the finest examples of traditional design elements such as decorative tile, painted, wood, carved plaster, and calligraphy. You will tour the souks and end your day in Jama’a el-Fna square, which is a UNESCO world heritage site. In Jama’a el-Fna, you’ll see snake charmers, story-tellers, henna artists, and dancers. This square has been the heart of the medina since the 12th century, a home for performers, travelers, and fortune-tellers. Stop for a glass of fresh squeezed orange juice and enjoy the carnival atmosphere. If you’re feeling brave, have a bowl of fresh snails or some sheep’s head (or have dinner at your hotel / riad). The route from Marrakech to Essaouira will take you through a region whose main industry is the cultivation of Argan trees. Local cooperatives produce oil from the trees, and the oil is used both in beauty products and in cooking. Once in Essaouira, you’ll see a well-preserved Portuguese fort dating from the 17th century and the large fishing fleet. Essaouira’s medina is charming, and there are plenty of small restaurants (and one excellent gelato shop near the large plaza) in which to eat if you prefer not to dine at your hotel. You can also choose your own fresh-caught fish to be grilled for you near the port. From Essaouira you’ll drive along the coast to Casablanca through scenic oceanside villages, including a number of resort towns such as Walidia, which is known for its oysters, and El Jadida, where many Moroccans come to enjoy the beautiful beaches in summer. End the day in Casablanca at your hotel. Morocco is a very special place, and our goal at is to share our love of this fascinating country with you. We want your travel experience to be fun, exciting, interesting, and memorable. Our Morocco’s tours will introduce you to Morocco’s people, culture, and history – not as a tourist, but as an honored guest in our (home).